England were some way short of their A game but still did enough to register their first victory of the World Cup by seeing off minnows Canada by 51 runs. Asked to bat first on another slow St Lucia wicket, they struggled for runs in the middle overs, before weathering a brief collapse to finish on 279-6. Canada were restricted to 65-4 after 17 overs of their reply but finished on 228-7, their best total in World Cups. 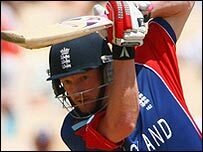 England had no Andrew Flintoff, banned by team management for poor discipline. Ravi Bopara came in as a replacement for only his second one-day international. 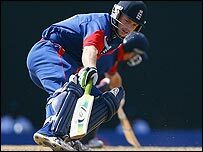 The Essex 21-year-old featured in a vital 81-run stand with Paul Collingwood which reinvigorated England's innings after Ed Joyce (66) and Ian Bell had got horribly bogged down by the spinners. In all, 94 runs came off the final 10 overs bowled by Canada. In the context of the match they were crucial runs, featuring Collingwood's 62 not out off 48 balls and an even more rumbunctious effort from Paul Nixon. After Joyce and Bopara had both been bowled reverse-sweeping, and Jamie Dalrymple caught behind attempting another peculiar cross batted shot, Nixon showed the shot at its best and ended with 23 not out off just eight balls. England had endured a troubled build-up to the match. Having been soundly beaten by New Zealand on Friday, some of the players "breached team discipline" during an alleged drinking session that went on too long. They were fined, and Flintoff, deemed to be the ring-leader, suffered further consequences. England stripped him of the vice-captaincy and banned him for the match, even choosing to leave him at the hotel when they travelled to Beasejour Stadium. Canada skipper John Davison won the toss and inserted the Test nation, who initially went along quite smoothly with Michael Vaughan (45) driving sweetly to collect some typically eye-catching boundaries. As has often happened with him in one-day internationals, however, one loose shot proved his downfall as a flat-footed drive off the medium pacer Abdool Samad flew straight to point. Barring one straight six, Joyce really struggled to keep the scoreboard moving when the spinners came on. The sparse crowd were bored by such impotent batting from him and Bell, and eventually so too were England's batsmen. The main benficiary was the 38-year-old slow left-armer Sunil Dhaniram, who took three wickets in 11 balls. Bell attempted a wild mow across the line, but the ball went straight up into the air, Joyce was bowled and Kevin Pietersen bunted a catch back to the bowler. It needed two energetic cricketers, Collingwood and Bopara, to instil a fresh sense of purpose into the innings. One over reaped 22 runs, including a six from Collingwood off a shoulder high full-toss that forced Samad - who had been warned for one such delivery - out of the attack. The total was way beyond the means of Canada, but Davison stroked a series of pleasing cover-drives to get their scoreboard moving. Unfortunately for them, the wickets column was also ticking along. Liam Plunkett bowled Geoff Barnett with a delivery the batsman left and then had Ashish Bagai caught at third man. Davison, who had a lucky escape when seemingly lbw to Plunkett on 12, eventually picked out deep extra cover off James Anderson to fall for 21. Then Ian Billcliff (20) hit a big six off Monty Panesar but lost his off-stump to Bopara to make it 65-4. As with the game against New Zealand, Panesar bowled beautifully but was bereft of luck. And in the mean time, Ashif Mulla (57) and Samad (37) began to embarrass their professional opponents with a competent partnership of 96. Mulla scored more readily, but Samad's massive six off Collingwood's slower ball, which left 119 wanted from 16 overs, created a frisson of tension. Vaughan returned to Bopara, who had the main man Mulla brilliantly stumped by Nixon, and England could breathe again. Samad followed, lbw to the deserving Panesar, in the subsequent over. But there was no quick demise and Canada eventually emerged with some credit. The main worry was that Dalrymple again looked to be out of his depth, failing with the bat and getting through just three expensive overs on a wicket that took plenty of turn. The positive was Bopara, but will England be brave enough to keep him in the side when Flintoff returns?